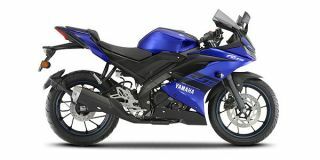 Yamaha YZF R15 V3 price in Delhi starts from Rs. 1.40 lakh (Ex-showroom). YZF R15 V3 is available in only 1 variant. Yamaha YZF R15 V3's top competitors are Yamaha MT 15 (price starting at Rs. 1.36 lakh in Delhi) and Bajaj Pulsar RS200 (price starting at Rs. 1.27 lakh in Delhi). Share your experiences with R15 V3? Q. How much is the service cost after the free service is over? Q. What is the first service cost? Around 700-800. For Engine oil and chain spray. The capacity of tank is 11 liters. Multiply it with rate of petrol in your city. Q. I am about to buy a new bike. Can u suggest me a bike between R15 V3 and FZ S Fi V3 for long rides Including high range areas. I am confused because of the price, mileage and comfort. Q. What about the maintenance cost and the initial payment? The mileage is 35-45 kmpl (approx.). The cost of service is under 1000 anytime including oil and filters. Confused about Yamaha YZF R15 V3?